While some dividend-paying companies give out occasional and unsustainable dividends, dividend-growing companies—such as household names like Coca-Cola, Exxon Mobile, and AT&T in the U.S.—provide steadily increasing dividend payouts every year. These long-standing dividend growers are called “Dividend Aristocrats,” and there are two reasons for it. First, with successful business operations and disciplined financial management, they are solid free-cash-flow generators and thus have a secured cash source to support their dividend policy for many years. 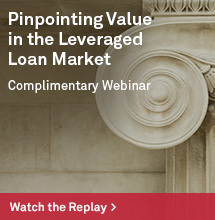 Second, once a company promises increasing dividends, it has to live up to the market expectation. Japan’s economy features its own household names (known as Ote kigyo 大手企業, “big corporates,” or Yumei kigyo 有名企業, “famous corporates”). Many of them are the stars of the prosperous Keiretsu economy: names such as Sumitomo, Mitsui, and Mitsubishi. 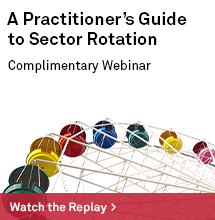 Others—such as energy suppliers and banks—started out regionally and expanded nationwide. Another younger group of big names gained a leading position with successful new business models and market popularity. For example, NTT DoCoMo, the predominant mobile operator, serves over 73 million customers in Japan and has a global presence in APAC, Europe, and America. 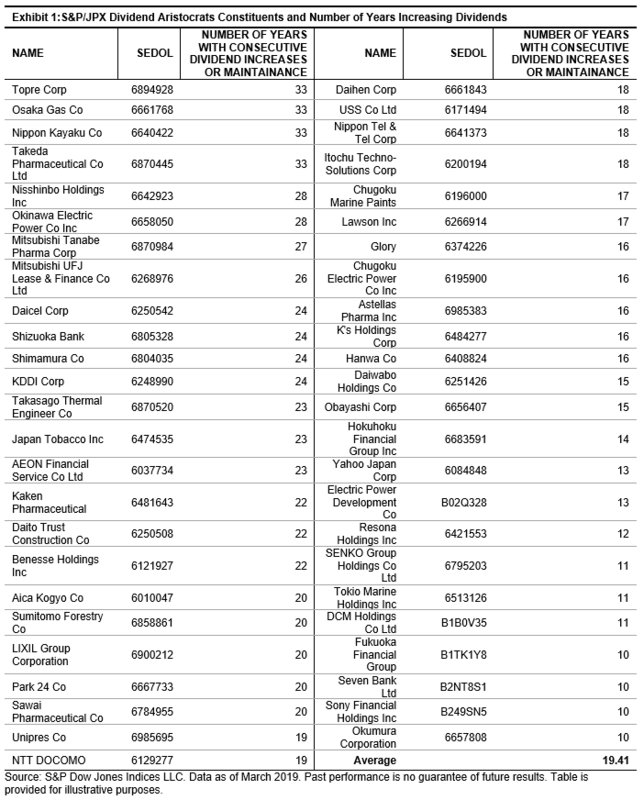 The S&P/JPX Dividend Aristocrats provides a transparent, rules-based way to track the Japanese Dividend Aristocrats,” a way to quantify the “Yumei kigyo.” This index includes Japanese companies that have increased and maintained dividends for at least 10 straight years. Its most recent constituents include popular brands such as Lawson Inc., Yahoo Japan, and NTT DoCoMo (see Exhibit 1). There are region-based companies: Osaka Gas, which serves 68 million households covering 3,220 square kilometers; Shizuoka Bank, which received the highest rating by Moody’s among all Japanese financial institutions; Okinawa Electric Power; and Fukuoka Financial Group. Keiretsu names are included as well: Mitsubishi UFJ Lease and Finance, Sumitomo Forestry Co, and Sony Financial Holdings. 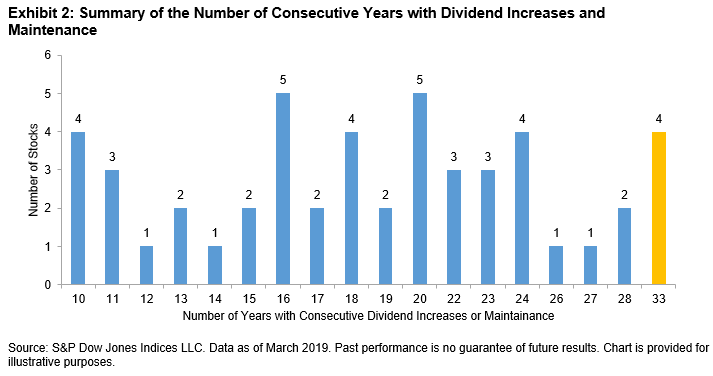 Although the hurdle of dividend increases and maintenance for index inclusion is 10 years, most constituents have a longer history of paying out increasing dividends (see Exhibit 2). The four top-ranking companies (Topre Corp, Osaka Gas Co, Nippon Kayaku Co, and Takeda Pharmaceutical Co) have an impressive record of 33 straight years. 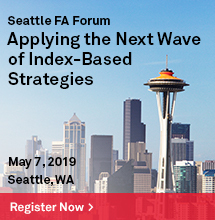 The index average is 19 years and over 90% of constituents have paid increasing or stable dividends for more than 10 straight years. 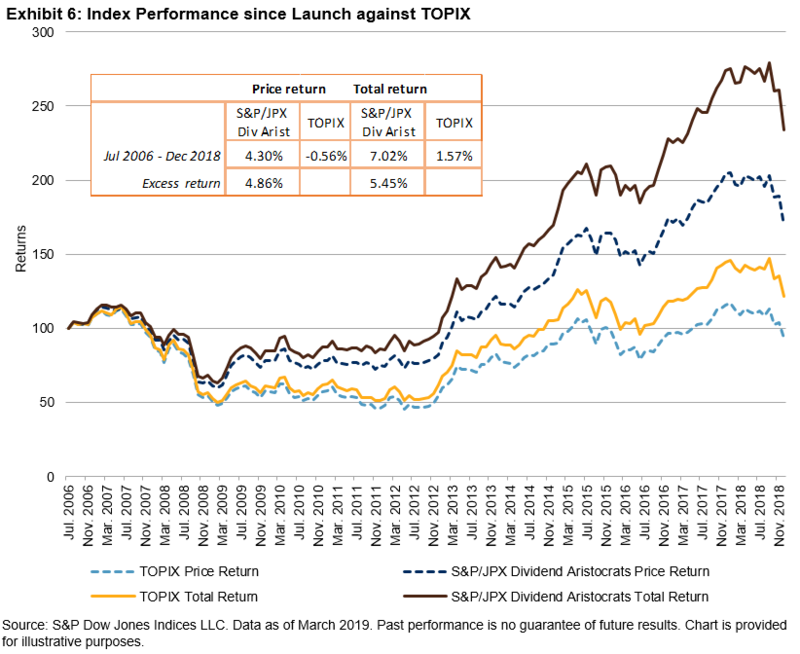 To see the benefit of the Dividend Aristocrats investment, take Topre Corp. as an example of a typical scenario. 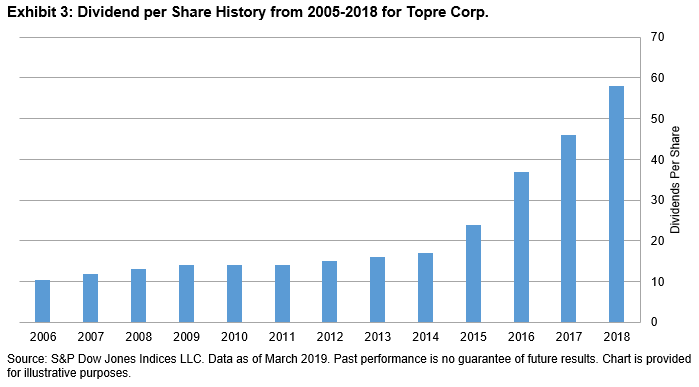 If we invested JPY 10,000 into Topre Corp. 13 years ago, thanks to its increasing dividend policy (see Exhibit 3), we would have received a total of JPY 3,059 in dividends by the end of 2018, at a constant 2% return from the dividend income every year. This profit would be in addition to capital appreciation. By the end of 2018, our equity investment would more than double from JPY 10,000 to JPY 22,380 (see Exhibit 4), an impressive average annual price return of 4.4% despite the 2008 financial crisis and the 2018 meltdown in the Japanese market. A broader picture with more constituent examples and with the S&P/JPX Dividend Aristocrats as a whole shows a similarly beneficial performance. Exhibit 5 shows the hypothetical returns for the top three constituents (by index weight) and for the index. As in the Topre Corp. example, we would invest JPY 10,000 for each stock or the index at the end of 2005 and hold it for 13 years. We saw excess returns for all cases when compared to the TOPIX during the period. Exhibit 6 visualizes the performance of the S&P/JPX Dividend Aristocrats as measured by both total return (with dividends) and price return (without dividends) since index launch. For investors who are worried about market volatility but wish to maintain equity exposure to generate income, the Dividend Aristocrats with their stable dividend growth may be attractive. 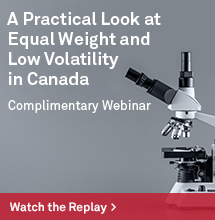 Refer to A Case for Dividend Growth Strategies.